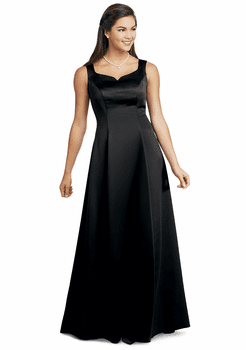 The Soltanto concert gown is a sleeveless dress made in our non-stretch, black satin. It boasts a teardrop neckline and slimming princess seams, which gives it a flattering and modest fit. Machine Washable. FWO Extras: The tear drop neckline is modest. The neckline in the back comes up to the neck bone.